Ballgame was one of the most popular Mayan sports. It carried religious and symbolic significance for the Mayans, and was also an occasion for entertainment. The sport of ballgame is prominently mentioned in the Mayan mythology, especially in the story of the Hero Twins. It was played between two teams of players who hit the ball with the legs, arms and hips. A large rubber ball was used for the occasion and the game often ended with ritual sacrifices offered to the Mayan gods. The origins of the Mayan ballgame can be traced back to the Olmec civilisation which was a precursor to the Mayan civilisation. Archaeological evidence at Olmec sites suggest that the Olmec had ball courts and played the game with rubber balls. This dates the origins of the ballgame as early as the 2nd millennium B.C. Mayans adopted this cultural trait and assimilated it into their mythology as well. In the saga of the Hero Twins in Mayan mythology, the story begins with a ballgame in the underworld. The uncle and father of the Hero Twins play ballgame by the doors of the underworld which annoys the gods and begins the story which leads to the adventures of the Hero Twins. Ballgame was one of the most popular Mayan sports. It carried religious and symbolic significance for the Mayans, and was also an occasion for entertainment. Mayan mythology states that the father and uncle of the Hero Twins were decapitated when they annoyed the lords of the underworld with the noise of their ballgame. The Hero Twins later decided to exact revenge on the underworld lords and challenged them to a match. In total, three matches of ballgame were played between Hero Twins and the underworld lords. The Hero Twins deliberately lost two of them in order to withstand the traps of the underworld. In the third match, the Hero Twins defeated the underworld lords. It is to this myth that the Mayans traced back the religious significance of the ballgame. Mayans made extensive use of the mythological symbols in ballgame. In the Mayan mythology, the game was directly linked with narratives of the underworld, and the victory of Hero Twins in the underworld. So in the real world, Mayans considered the ballgame as a symbol of the transition between life and death. Victory in ballgame meant the overcoming of death and the victory of life. Scenes from the Mayan underworld were inscribed on the ball courts across different Mayan cities and murals depicting Mayan creation myths were a common motif at these courts. Mayan ballgame was played between two teams, and is considered one of the oldest team sports in the world. The court had a line drawn along its centre, and each team attempted to toss and hit the ballgame towards the opposite end of the court. In some variations of the game, a stone loop was affixed to one of the walls of the court and the teams were required to hit the ball through the loop. The players were not allowed to touch the ball with their hands, although they could hit it with their arms, legs, feet and hips. Several depictions of Mayan ballgames, at the extant remains of Mayan ball courts and from other sources, show ballgame players. According to these depictions, Mayan ballgame players wore a brief but definite costume during the game. Since the rubber ball was fairly heavy and hard, the players wore padding at their arms, elbows, wrists and hips in order to avoid injuries when hitting the ball. Some depictions show the players to be wearing helmets of different sorts, including a ceremonial headdress which was probably worn before or after the game. The winning team was given a sort of trophy upon its victory. Two types of ballgame trophies have been recovered at the site of Mayan cities. One of these is called hacha and was a stone sculpture in the imitation of human head which carried a handle with it. Another type of trophy, called palma, was a costume accorded to the winning team or the best player. U-shaped stone yokes were also awarded as a token of appreciation to the better players. Most of the trophies were carvings of various objects in stone and have been excavated from grave-sites in Mayan cities. 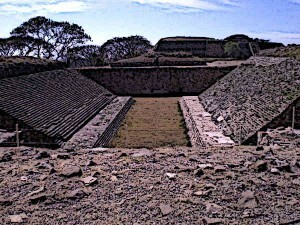 Mayan ballgames were played at special courts constructed for the sport. Ball courts have been excavated in nearly all notable Mayan cities, making them a major part of the monumental architecture of these cities. Typical construction of the ball courts included two imposing stone walls with a large rectangular space between them. The game was played in the rectangular space while spectators usually stood on the side-walls. In some constructions, the walls on the side are slanting while in others, they are sharply vertical. The largest surviving Mayan ball court is located at the site of Chichen Itza, measuring 146 meters in length and 36 meters in width. Mayan ballgame was often played between a Mayan team and a team of captives from another city. If the captive team lost, which was most often the case, the Mayans would offer them as human sacrifices to the gods. For this purpose, temples were usually located very close to the ball courts. Sometimes, rather than sacrificing the entire losing team, only the captain of the losing team was sacrificed. Ballgame was a popular sport among the Mayans and it carried immense religious and mythological significance. For Mayans, ballgame represented the transition between life and death, and was a symbol of the underworld. The sport is frequently mentioned in the Mayan mythological tale of the Hero Twins and their adventures in the underworld. The game itself was played between two teams and the gameplay comprised of hitting a rubber ball across a large court. Players wore specific costumes and were honoured in the Mayan society. At the end of the game, the offering of human sacrifices to the Mayan gods was a frequent custom.